I'm back!! Almería and Málaga were ridiculously beautiful and relaxing, and through it all I ate like a champ and rested like a pro. I'll tell you more about the trip later (with a few recommendations in case any of you find yourselves in Southern Spain any time soon), but for now I thought I'd post what turned out to be my beach essentials. 3. baseball cap - again, mine's from H&M, the men's department, but anything to block the sun while you're napping face up will do. 4. a coverup - this sheer cotton shirt from Zara was perfect (especially since, unlike the model here, my legs are not 5 ft. long, so it was much longer on me), both for when the sun was hitting too hard, or when the wind was sandblasting us. 5. sunglasses - these, picked up in Madison last summer, are still my favorites. My other countless pairs are feeling neglected, but I'm trying to reduce object-induced guilt. 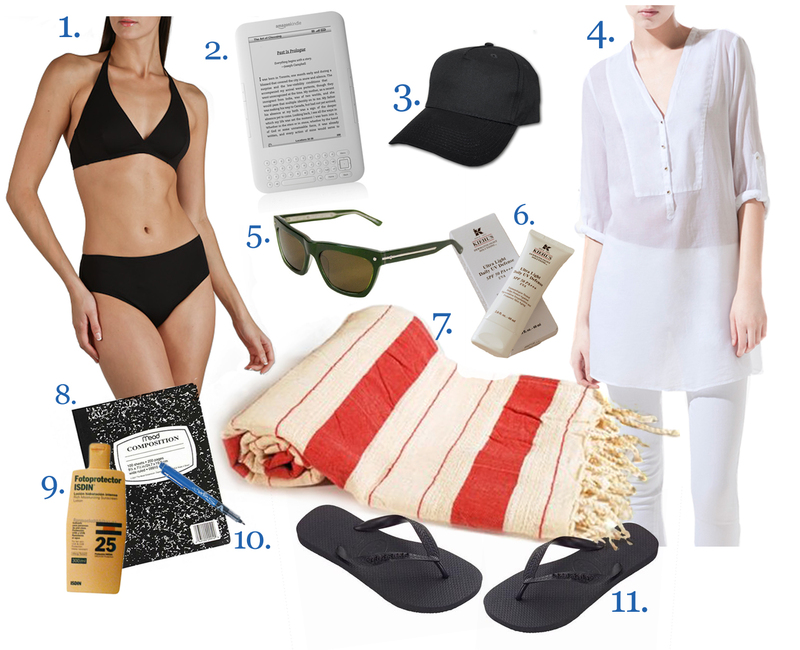 7. peshtemal - turkish bath towels are the best for the beach; they take up very little room in your bag and are great for laying on, drying with, and wearing as a wrap. 9. sunscreen for your body - something with a high spf, applied liberally, every few hours. That's how I went from Snow White to Beyonce. Ha! Seriously, I came back with what I thought was a savage tan but literally NO ONE noticed. Just goes to show you how very very pale I was to begin with. Now I just look normal. 10. a favorite pen - not your father's cherished mont blanc fountain pen, just a good solid fat pen that makes you happy, that you can scribble with even when you're weakened by hours of sun and sea. 11. flipflops - havaianas for me, always. They never give me blisters. But that part about them not getting hot in the sun? Lies. Nevertheless, I love them.